What do you do when you've got a dated golden oak kitchen, but not the budget to replace it? 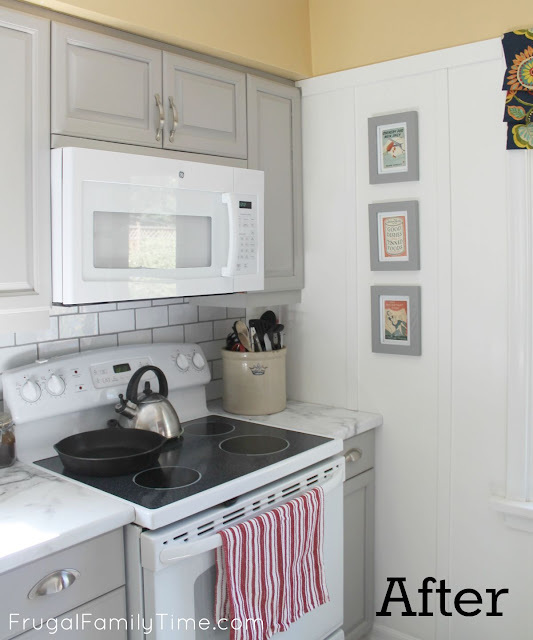 What if those same cabinets are in too good of shape to take a sledgehammer to? What if your life is maxed out busy and you can't have your kitchen out of commission for even a few days? That was us. And maybe you too? We were tired of our tired kitchen. It had it's flaws, not just in style, but in substance too. The storage and counterspace were limited and what we did have just wasn't functioning well. So we got creative. And busy. And patient. Patient? Well, this reno took us more than a few days. It was a few months. By our own choosing mind you. 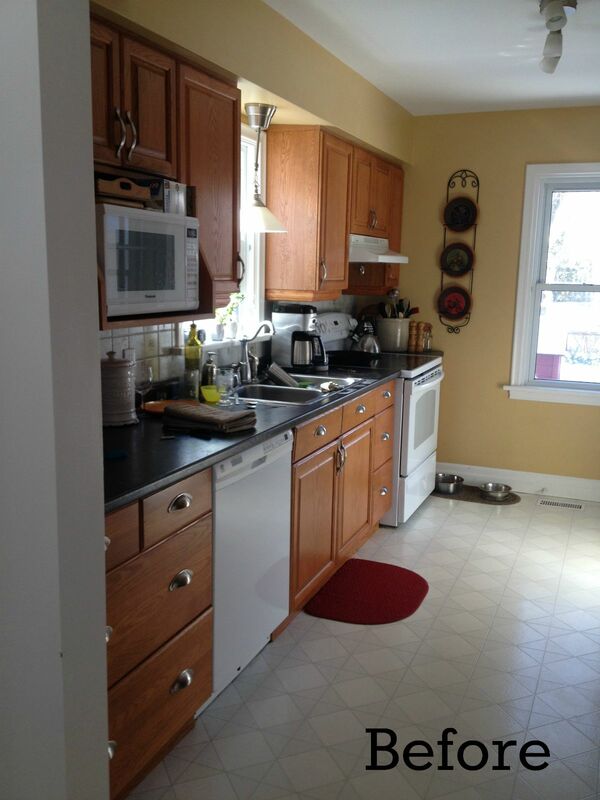 We had many small windows of time in which to tackle this reno. If we had the luxury of some days in a row we could have banged it all out in a week. But that's not our reality. So we coined this makeover "The Slow Mo Kitchen Reno". 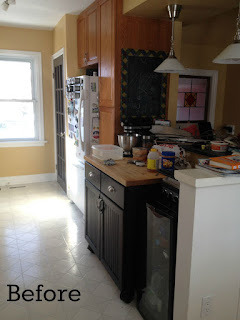 We didn't have a single day that the kitchen was out of commission, but we had a few months where the kitchen looked half-baked. 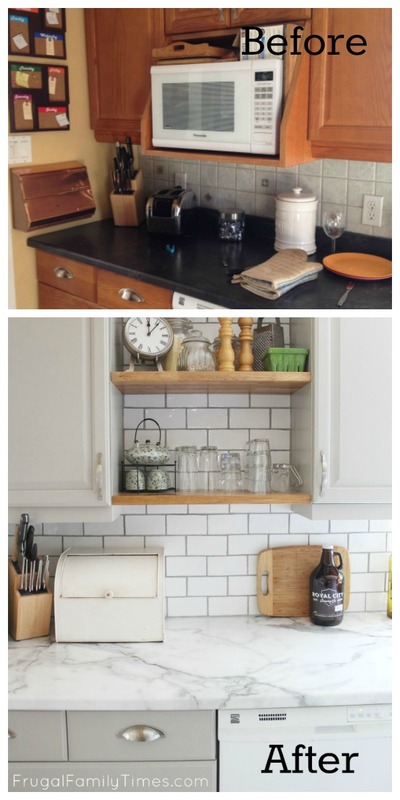 We will share lots of how-to's in future posts, this one is all about the Before and Afters! 2. In the spot where the microwave was, we built open shelving. (Sigh. So much prettier.) Click here to read about it. 3. We tore out our old black granite-like countertops - which were dark and damaged. We found a pretty marble-like laminate to install in its place. 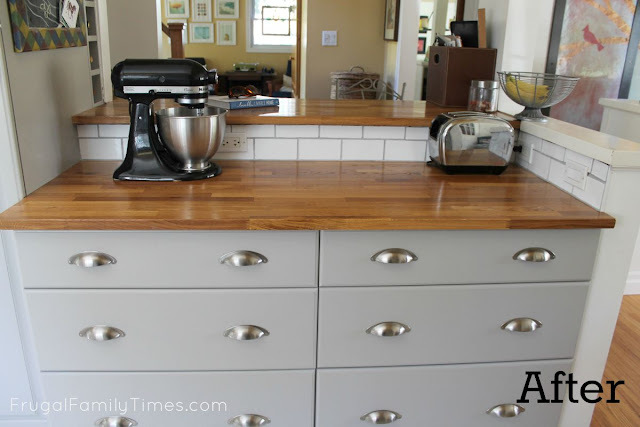 (So many reasons to love laminate! 4. We tore out the fruity old backsplash and installed a new one. 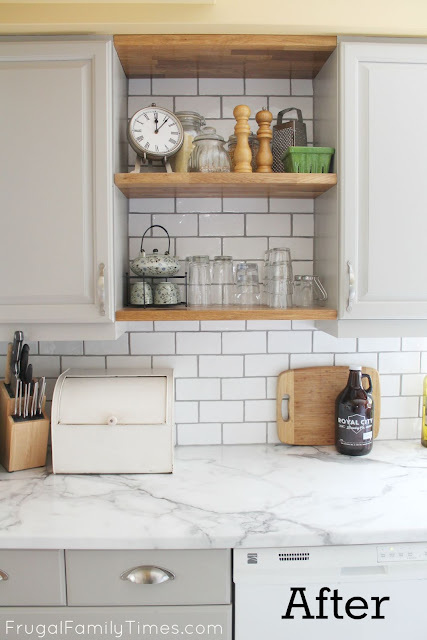 (Classic subway tile, with a twist. 5. We painted the old cabinets. (Time-consuming - but worth every second. Except when we tried to spray them, that was a worthless, drippy mess. Speaking of saving, we did this all on a pretty tight budget. Our whole "Slo-Mo Kitchen Reno" was half the cost of the marble countertops I priced out at the start of all this. I love that! 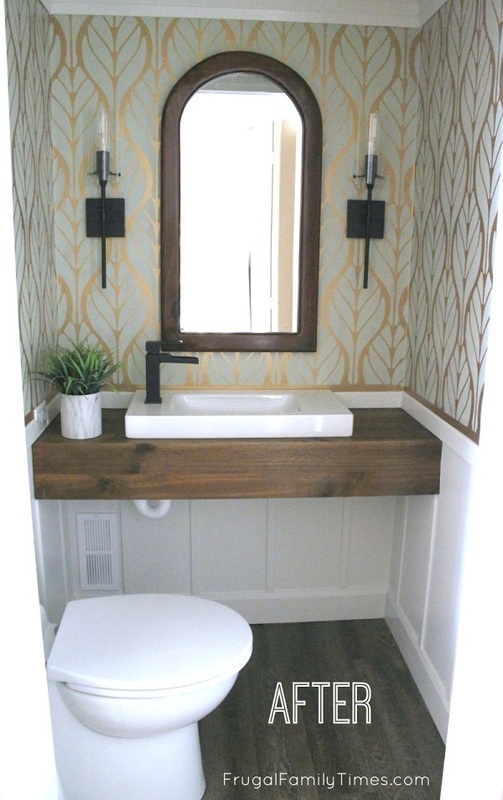 Over the next few posts, we'll share some how-to's for this reno. Do you have an opinion? What would you like to hear about first? 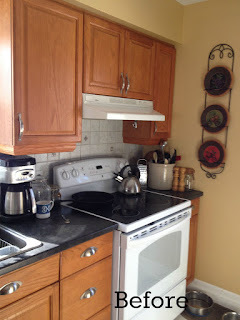 Love the new kitchen! What color paint did you use? Looks awesome! Thanks, Becky! The paint is a Sherwin Williams colour: Pussywillow. We had it colour matches at Home Depot in Behr latex enamel. I love the colour! Lovely! 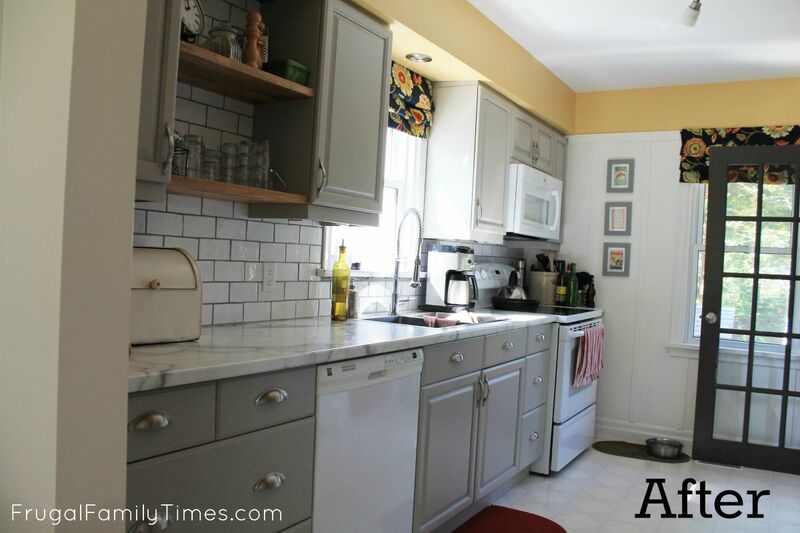 I love grey cabinets- I love how everything has lightened up your kitchen. I vote to hear how you made/adapted the drawer cabinet. It IS so much brighter, cred! Make me happy. :). Your vote is noted ;). Hey Robin ... I don't care WHAT order you share the reno ... as long as you share every last detail! Looks Fabulous - I am so inspired by you & Ed. 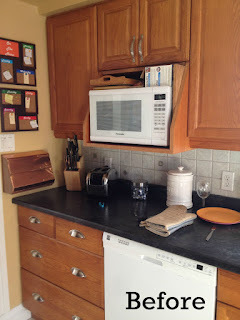 Our first kitchen "reno" in our house involved sanding and painting cupboards so heavy with lacquer and aged that they were turning orange (the agent called it "cottage pine look"). And unlike your lovely DIY, my husband insisted on peel and stick flooring. *hangs head in shame** Although I did paint the counter a glossy black with laminate paint and that lasted for ages. Mind you, when it was time to do it up right, I did... and I'm sooooo much happier now. You guys did a great job! 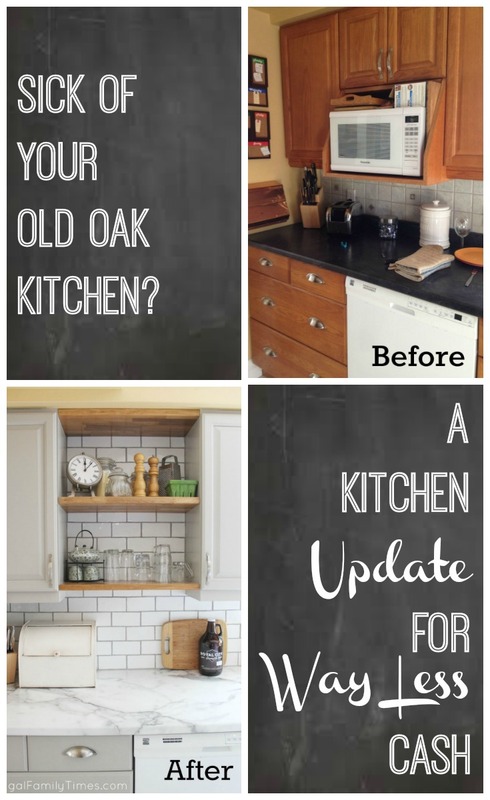 Your kitchen looks amazing!!! What color did you use on the cabinets? Where did you say you got your counter tops for a great price? And what kind was it?